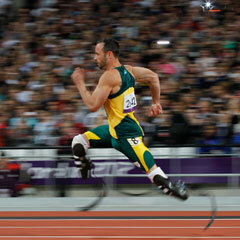 London - Oscar Pistorius and countryman Arnu Fourie set new world records in the first-round heats of the men's 200 metres T43/44 event at the Paralympic Games on Saturday night. Double amputee Pistorius, making his first appearance at the 2012 disability showpiece, clocked 21.30 seconds to improve his own global mark in the T43 division. Having made history a few weeks earlier at the able-bodied Games, Pistorius showed his intent early on at the Paralympics by comfortably winning his heat and coasting into Sunday's 200m final. Fellow South African Fourie, a single-leg amputee, set a new world best in the T44 division. Fourie also reached the final, finishing second in his heat in 22.57 --0.34 seconds behind American double-amputee Blake Leeper. Brazilian Alan Oliveira won the first heat in 21.88, storming clear of American favourite Jerome Singleton in the finishing straight.